A long time ago in a Korean town far from the enticements of Soeul I discovered the pc bar and Korean pc bar culture. I lost (according to battle net) 350 games of Starcraft and won one. With such unescalating returns I decided to try the other games at the pc bar only to find a Korean I’d was required to get into the average kart game. However there was an exception. Guild Wars was everywhere, billboards advertised it on the sides of buildings, Korean newspapers reported on Nc Soft’s acquiring some of the original developers from Blizzard, The game was everywhere and unlike nexon’s cafe games it was open to all. I logged in as a woman and began to play. The server was derelict, a few npcs strolled around, some large town houses loomed in the fields, and worms were everywhere. I was supposed to kill the worms. I turned it off and sold my account. Mmos weren’t for me. Desire is, in psychoanalytic theory, a creation. We learn to desire and it’s origins are often frivolous. A film might teach a girl how to desire as a woman, a role model might inspire a boy to a life in mathematics, but games (outside of their filmic parts) inspire desire in very different ways. We often don’t identify with games the way we identify with other art forms. If you watch a film you empathize, you hate, you love, characters in the film. Their behavior forms a fabricate that becomes the agent of desire and spreads wide ideas of how and what desire should be used, maintained, and sublimated. In games desire is often created by sensation or rewards. If you play chess and you win, you will probably want to play chess more. If you play a first person shooter, even if you detest the main character and story, the sheer spectacle of rocketing into combat might be enough to make the game stick and hence, to use the Deluezean term, a desiring machine is born. Games work in other ways too, and their cinematic elements can make the game stick too (I love the characters in hunted: the demon’s forge, but detest the game play), however I will maintain the three central ideas of sensation, rewards, and identification for the remainder of this review, even though final fantasy xiv has a strong social element to it, and that selfishness vs selflessness of the game is often not explored. After Guild Wars I didn’t bother with mmos. I looked at them and just thought, that’s not for me. A friend however installed Skyrim on my pc and while I didn’t like it at first, the game quickly became an obsession, the thought of sending my Mage to Mage school, of developing npc control techniques, and just the general expansiveness of the world drew me in. What does Skyrim teach me? To desire character growth, branching skill trees, and to bear with repetive actions for a minor reward. The the results of these labor gave me a few valuable moments, such as when I learned I could take down trolls in a few hits, or casting an illusion spell that enraged guests at a wedding enough that they killed the bride (who I in turn took the dress off of and then enchanted with a 100% discount on destruction spells). Skyrim taught me that building a character can be rewarding and highly empowering… Perhaps a little bit to much so I took down the final boss with no problem. After Skyrim I fell in love with Spore which attenuated me to the click and wait tactics of many mmos, when I began to realize the strategy lies outside of the actions you are taking the game took on a new light, and well it gave me the fortitude to make it through my first few levels in ff xiv. So that takes me to almost up to Final Fantasy xiv 1.2.3. I bought the game from amazon and downloaded it, then downloaded the patches from another server. I placed my bets on FF XIV because unlike every other mmo, it launched with an absolutely abysmal reputation, but as the game was patched and fixed YouTube videos led me to believe it was getting better, hence for 19.99 I would be entering into a game that come October would retail for 59.99 on the ps3 and a game where the developers seem to be in consistent communication with the fan base. If it turned out I didn’t like I just had to wait a month or so and then sell my key for more. The first thing ff xiv did right was drop me into a storyline. The Gridania storyline opens with an absolutely beautiful cinematic backdrop and then introduces us to two fairly comical characters with British accents. I know that British accent = fantasy world, but somehow I always feels that final fantasy characters aren’t quite indebted to such Tolkein like lineages to require the Queen’s lisp. I would have preferred an American accent on some of the characters, but the voice acting is above average, and the humor pretty good. So score one ff xiv, you didn’t make me kill worms. Next the game went into a quick combat tutorial which my thaumaturge went through pretty quickly, then even more story and finally I was dropped off in the woods with a good sense of how to get home. I grinned a little and quickly leveled up to 5 in no time before hitting the adventurer’s guild and be introduced to Mom. Mom is an npc who gives you you’re initial quests. In Gridania people develop Woodsin, a kinda karmic retribution for harming the woods. In other words all those lingering doubts about litter, recycling, are made into game form and form a rather good impetus to continue the quest line and avoid being eaten by an elemental. However the game devolves a little here, instead of being given more story quests, it becomes centered around guidleves. Guidleves are simple quests that involve doing repetive things for exp. Battlecraft fieldleves produce orange hotspots on the map were you can battle enemies at levels you set at a crystal. The leves are based around camps and include crafting leves and battle leves. I found the grinding to be not overly hard, but just a little grueling. I really would have preferred more content and less battling for exp, but until you hit 50, the game requires a little grinding. The grinding however doesn’t take terribly long provided you get in a party, choose a leve that’s just a little above your parties’ level, and then manage to chew through your creeps in time to get a chain exp bonus. Chain bonuses are awarded by battle time, the faster you kill creeps above your level the faster your bonus grows. Chain bonuses can level up a class pretty quickly, but do slow a tad at times if your party is lower level than you. You can grind about 2 levels an hour after level 10. Before level 10 you can do more than 5 an hour. Parties have the advantage of leve sharing so your four leves plus the other party members leves quickly add up and because they’re adjustable as you level up you can make the enemies more difficult meaning exp doesn’t shrink as you get higher. The leve system is pretty good and is more efficient than using a macro bot to level you, but I still feel it needs more variety, a little more storyline tie in, and could give a slightly bigger exp bonus when you hit the dreaded mid levels where exp remains constant, but the amount needed to level grows. At first combat annoyed me, the click and wait method really got on my nerves, but around level 20 all these things dissipated and the reward of smack, kill, run away!! Begins to fall into place, mmos reveals the dissonance between a player’s first reaction and the developers over exposure to the game. The combat in ff xiv is really offsetting if you haven’t already played similar games. I will not even begin to discuss the crafting which is just an awful game mechanic that needs to be done away with as quickly as possible, combat has the incentive of being social: parties are fun, strategic: you have to make decisions about which enemies to take on, who to heal, and other questions, and your characters attributes factor highly into their damage output and input. Crafting on the other hand is just a set of menus. I actually just created an autohotkey script that presses enter once every 5 seconds and let it run for 3 hours, this usually nets me about 2 levels in crafting and 99 of whatever thing I am making. The major lesson mmos teach us is that systems attract game players, the question one should be asking then is, what systems are worth it and why? What mechanics should input and export from the system and why? A lot of the design principles in ff xiv are based off ideas of the real and not so much on fun, using a menu is not fun regardless of how much worth a high level crafter might bring to the game, crafting needs to be a game in itself and not just a bunch of menus off setting to first timers. Addtionally crafting is complicated by necessary items, in gridania for instance a culinarian can create marmot steaks. Marmot steaks require marmot meat and gridania walnuts, two things the forest is full of, however the recipe also requires garlean garlic an item only found far from gridania, hence marmot steak, an item intended for low level culinarians and to buff low-level melee players can not be made until a player has reached the their 20s or 30s. This additionally complicated by an undesirable gathering system that while slightly more interactive and interesting than crafting is still sub-par. A botanist for instance is presented with a simple interface (not even mapped onto the in question) in which they set a notch in the tree and then have to time their button presses to swing as close to the notch as possible, the game breaks all sorts of video game logics, it rarely nets you wood (believe it or not you can get garlic by swinging an axe at a tree), but it also takes a possibly interesting part of the in game economy and boils it down to a mini-game that is less well developed than many prototypes on new grounds. This brings me to one really nice part of ff xiv: the economy. Ff xiv has a huge crafting economy. All the little trinkets you collect from battles or gathering leves become items sellable at the market wards or craftable if you have the complimentary items. The market wards are still problematic, while asking an npc will search all available items in the wards, npc still compete for space in the wards, but talking to an npc in the main room bring up a search function which shows how much an item just sold for and quantities. I am not sure if it includes all the npcs In the wards, but I believe it does connect you to other npcs. This means that the game supports a rather impressive player driven economy. I find myself buying almost all my gear from the wards because someone high on virtual life just produced the exact staff my conjuror needs and is selling at half the price of npcs, other items though might not be as profitable, cotton for instance is priced at twice it’s npc price because apparently many players don’t know that cotton is sold by npcs at the weaver’s guild in ul’dah. The wards additionally are difficult to access and make little sense in the game’s world (I would prefer to have an npc at a shop that takes down what you’re selling at makes a big searchable list of all the items players are selling in game and let’s you stay in the city you’re in), but square should be complimented for creating a recipe for almost every in game item. The possibilities are amazing and it makes crafting a humanitarian gesture, another player on a quest with me crafted two diremite rings for my conjuror when she saw some of my spells slip. The ability to make items on the fly is cool, it’s just boring. Crafting only creates desire with in social networks, not by the crafting game itself. Additionally motives of profit or sharing bear down on this menu based sub-game (hint if your item glows red wait, only use careful synthesis when you at 80% and have over 30 durability remaining). We learn to desire crafting by coercion outside of the game itself. I can think of few games I play regularly just to impress others. Learning to desire with in the limits of an mmo is hard, but once there the space of availability is huge, the character builds diverse, etc. mmo are peculiar Once you get into the game enough to care about your character, the crafting becomes a minuscule, but necessary chore, but you may as well disable the option till you reach at least 20, the game simply isn’t any fun when all you’re doing is menus. 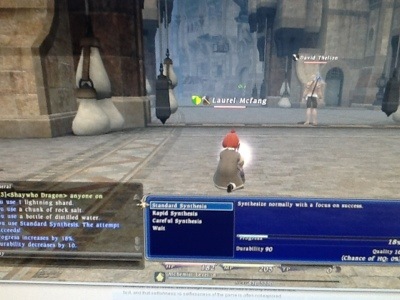 Crafting bots for ff xiv exist on the net and can be downloaded easily, but I wrote one in autohotkey in about 10 minutes just using their API, but it does have the disadvantage of producing the same item over and over again something which the game punishes with diminishing exp for each serial item made. 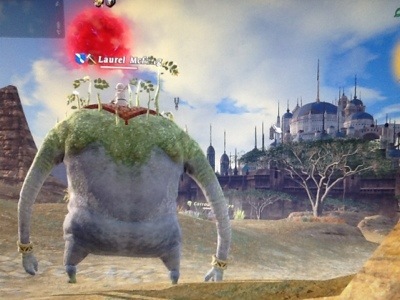 Right now ff xiv is flush with players trying to grind to 30 and get a goobbue mount before the goobbue mount is removed in 1.2.3a because of this I might have come into the game during a grind heavy time instead of a story centric period, I have done two storyline quests with other players and both went the same way. For Imperial Devices you make your way to a remote location in gridania and then your party is granted one hour in the dungeon. The dungeon is beautiful. A swooping cinematic introduces it and then you the actual layout lacks inspiration, but is serviceable as a dungeon. My party included one level 42 gladiator who pummeled us through the mission in o time. I think it would have been more fun with just level 30s, but the final boss is quite hard and really takes a tank. Seeds of Initiative went similarly a level 50 killed the boss for me, however this added on job quest tied into the main storyline perfectly and made sense in the context of the game which furthers adds to my claim that the game is fairly well written. Square has over twenty years experience creating fantasy content, and their writing has improved remarkably since the NES days. However right after an elemental protesting killing in the name of the forest you are given a mission to “take down” an over grown bird in another land, hence non-lethal missions for the white Mage are necessary according to the story line, but chafe with the games combat mechanics. However support classes can definitely play non-lethally and in fact might prosper if you place your attribute points along such a line. Ff xiv is one of the few games in which the support class is really important and necessary. Once one is attenuated to the game, the actual act of proceeding through dungeons becomes strategical and the conjuror becomes a fairly important class. Less then 28% percent of players choose support as their role hence a good white Mage is in demand. In the game the white Mage has to balance casting and cool down times with estimations of when party members will take damage, and who to prioritize. This is more demanding that it seems and I really loved my time healing other level 30s and sacred prisming into stone skin for my exp party. The game’s supporters will have their hands full mending every scrap, while managing a dwindling mp pool and enemies intelligent enough to go for the healer’s throat. That is once you get past that initial discomfort of click and wait, the oddness of the crafting system, the unfamiliar elements in recipes, the necessary linkshells never explained in a tutorial, the mending and repair systems, the sparse story line, the pressures to help your friends, and all the other desires you become attenuated to in the games initial hours. Johanthan Blow at a talk at rice university gets into the idea of skinner boxes and creating desire. Desire is certainly created, the mechanisms of desiring machines are various, but the problem with skinner boxes is how they reveal how blatantly desire can be produced. The act of positively reinforcing something causes a subject to desire. Given such a blank state, the ethics of desire comes up. We can for instance create a desiring machine between a child and an interest or between a child and a commercial product. Capitalism often prefers addictions that lead back into consumption and production is often left on the sidelines. If the games that mmos make us play are actually beneficial is a question I struggle to answer. Currently I am incensed that my server is down , I had an entire to do list of crafts and quests to do, but to critique mmos purely off their skinner box like means of producing desire loses the fact that other games attenuate us to tasks that might not be beneficial either. Additionally mmos make their means of producing desire blatant, a player goes away knowing that they were in a way conned into liking something, but the result of all this clicking, waiting, and calculating is a game that’s surprisingly deep and varied. Players have built and rebuilt classes to discover the algorithms behind spells, the effects of leveling, the most efficient means to achieve 50 in a class and the diversity of builds is immense that for parts of the game one must become dependent on others, and that is where the game really shines: in dependency. On one of my linkshells a cat gives me all her food so I can level up my culinarian class, on another I am asking a blacksmith for cooking knives. All of this is so satisfying I don’t find myself wondering to other games, trying other things, yet I do not feel strongly enough to feel overwhelmed. These games crudely produce mechanics that are terribly offsetting to first timers, but grow into emotional worlds and kinships, they became minor tasks in a social order, mmos show us how far we’ll go for friends.